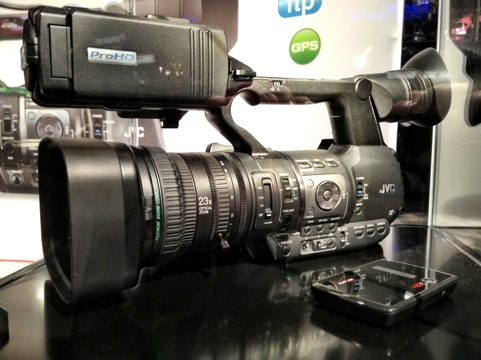 JVC is showing pre-production models of a news camera called the GY-HM650. This is a web-friendly broadcast-quality handy cam. When it ships in December for $5695, it will have the ability to FTP from camera and be able to connect to wifi. The magic here is that it has dual encoders that will let you record HD to one card and web-rez H.264 (among other codecs) to the other, and then send it out. But not live, unfortunately. The HM650 does have both hdsdi and hdmi outputs so you can output live. This is a very interesting camera for news.